RUSH: Here is Stephanie in Atlanta. It’s great to have you here. Hi. CALLER: — from Tiffany, I got curious so I went online and I looked up some inauguration pictures from when Obama was inaugurated. And there, big as life, are pictures of Michelle giving a gift to Laura Bush. RUSH: Yeah. I’ve seen it. Somebody sent me the picture, and there’s a problem with the attachment. I was gonna open it and put it on the Dittocam, but I didn’t have time to make it happen here. CALLER: Yes, a white gift with a red bow. RUSH: So it was in 2008, right? CALLER: Yes. It was when they were with the Bushes. RUSH: Right. And Michelle brought Laura Bush a gift? CALLER: — I don’t know what Michelle’s problem is. RUSH: Let me help. What could possibly be Michelle’s problem? What could Michelle Obama possibly be miserable, angry, and unhappy about on Donald Trump Inauguration Day? Donald Trump’s inauguration. What she did was just rude. Somebody sent me the photo of Laura Bush being presented with a gift by Michelle Obama. And I’ve been unable to open the attachment, it’s got some corruption, and I haven’t had a chance with everything else going on while I perform and execute the program to figure out what’s wrong with the attachment. ‘Cause if I’d been able to open the attachment, we could have put it in the Dittocam switcher and I could have shown you. But, as such, we’ll find it; we’ll put it at RushLimbaugh.com. It will be on the app as well. It illustrates, does it not, the grand hypocrisy of these people as well? Something for which they are rarely, if ever, held accountable. RUSH: Okay. Here we go. 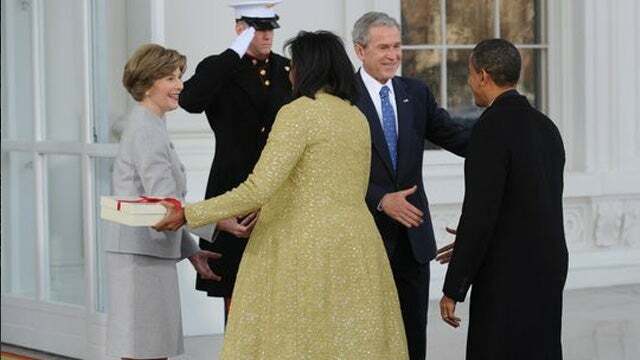 For those of you watching on the Dittocam, we’re gonna switch now to the photo of Michelle Obama bringing Laura Bush a gift on Obama Inauguration Day in 2009. And there it… That is a gigantic coat that Michelle Obama is wearing. Would you not agree? That coat looks like it never… (interruption) No. No, no, no. (laughing) Thank goodness I stopped myself. It’s a huge coat. But there she is. She’s handing the gift. It’s a white gift, red bow in it, and there are smiles all around. Laura Bush does not look confused or perplexed or offended or any of that.